It is a wine from the 1863 harvest. 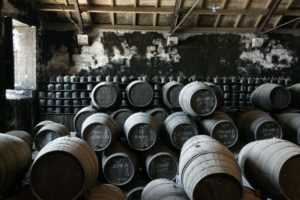 Franciscus Marius Niepoort filled the great vintage in wooden casks and laid it down to rest it in Niepoort’s maturing cellar in Vila Nova de Gaia, where the wine was used for blending the famous Niepoort tawnies. 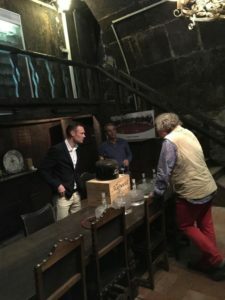 More than forty years later, Dirk Niepoort’s grandfather Eduardo Niepoort transferred the wine that remained into glass demijohns, vessels with a capacity of between eight and eleven litres. Nine demijohns were – as it is noted in Niepoort’s cellar book – filled with the rare vintage on 18 September 1905. The wine remains even now in those glass bottles from the 19thcentury, still maturing. From time to time it has been tasted with great respect, and served to selected guests. In 2012 – meanwhile, Dirk Niepoort had taken over the management of the family business, in the fifth generation – Niepoort created the legendary VV (Vinho Velho) to celebrate the company’s 170th anniversary. 999 bottles of this wine were produced, a blend of very old and valuable lots; a substantial part of it came from the demijohns of vintage 1863. One last demijohn was left when Dirk Niepoort – on the recommendation of wine critic James Suckling – established contact with the traditional French glass manufacturer Lalique, still practitioners of one of the oldest glassmaking methods, the lost wax process (cire-perdu). 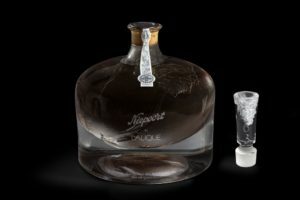 This technique, passed down through generations by master craftsmen of the trade, is still used today at the Lalique factory in Alsace to create these carafes that are modelled in shape after the demijohns that lie in Niepoort’s cellar in Vila Nova de Gaia. Incidentally, the high sum of money fetched by the wine breaks all records. Niepoort will be added to the list of Guinness world record holders. 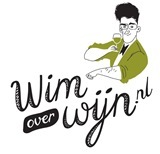 Dit bericht is geplaatst in importeurs, Internationaal, Redactie. Bookmark de permalink.